Over the last couple of posts, I’ve taken you to Hawaii for salmon poke and to Tahiti for poisson cru. Today, I’m taking you halfway around the world to Italy for pesce crudo, which literally translates to “raw fish.” It is similar to the Japanese sashimi, but instead of wasabi, soy sauce, and pickled ginger, Italians traditionally dress the fish with extra-virgin olive oil, lemon, and sea salt. As with the other raw fish dishes I’ve shared with you, the key to crudo is to use the freshest quality ingredients and let their flavors shine. 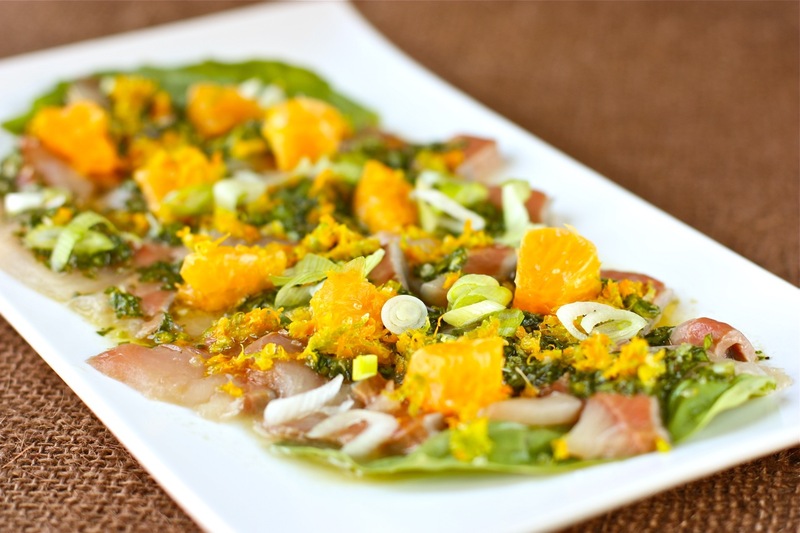 For this pesce crudo, I broke with tradition by replacing the lemon with orange juice, but, on the other hand, the chopped basil and garlic in the vinaigrette adds more Italian flair to the dish. Don’t skimp on the citrus salt, which finishes the dish very well. Not only does this combination of citrus zest and salt add visual appeal, it also brightness the flavor of the yellowtail. There’s a little bit of heat, with the addition of red pepper flakes, which balances the dish’s tartness and saltiness. This is truly a light and refreshing dish! This crudo recipe would also work well with scallops and other fish like halibut, red snapper, and tuna. Place 3 or 4 basil leaves on a serving plate. Arrange the slices of yellowtail on top of the basil. Cover and refrigerate. Combine the lemon, lime, and orange zests with the salt. Set aside. Whisk together the orange juice, olive oil, garlic, and red pepper flakes, if using, in a bowl. Stir in the basil and season with black pepper. 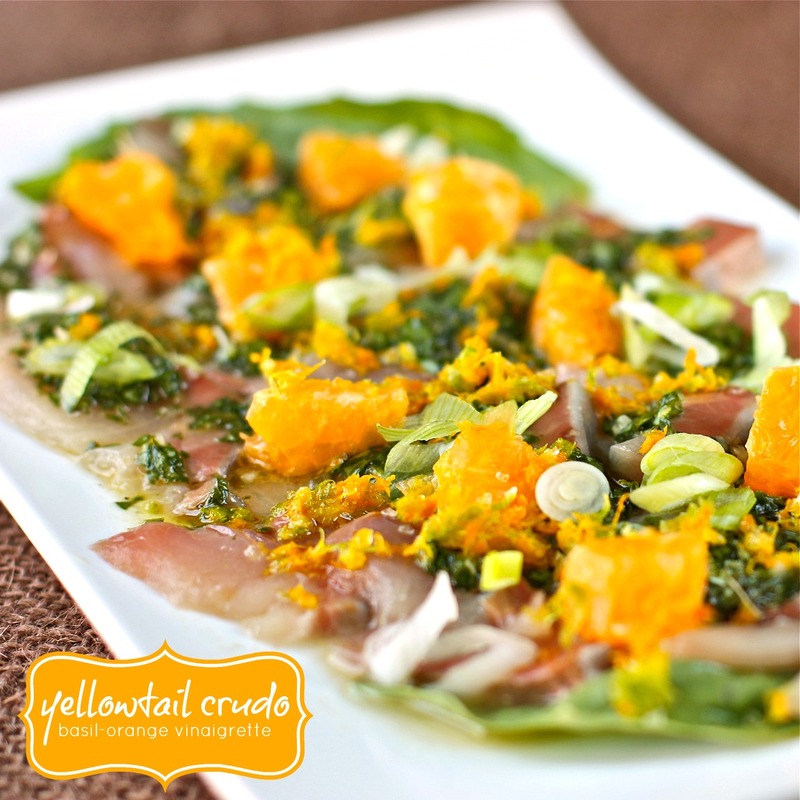 To assemble, drizzle basil-orange vinaigrette over the yellowtail slices. Scatter orange segments and green onions and sprinkle citrus salt. In France we love this kind of dish! This is my favorite way to eat raw fish at home! I *adore* crudo. Again Daisy, your photographs are just so beautiful.